An aerial view of the City of Ten Thousand Buddhas. The City Of Ten Thousand Buddhas (traditional Chinese: 萬佛聖城; ; pinyin: Wànfó Shèngchéng; Vietnamese: Chùa Vạn Phật Thánh Thành) is an international Buddhist community and monastery founded by Hsuan Hua, an important figure in Western Buddhism. It is one of the first Chan Buddhist temples in the United States, and one of the largest Buddhist communities in the Western Hemisphere. The city is situated in Talmage, Mendocino County, California, about 2 miles (3.2 km) east of Ukiah, and 110 miles (180 km) north of San Francisco. It was one of the first Buddhist monasteries built in the United States. The temple follows the Guiyang school of Chan, one of the Five Houses of Chan. The city is noted for its close adherence to the vinaya, the austere traditional Buddhist monastic code. 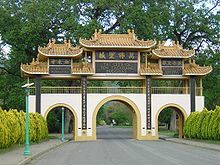 The Dharma Realm Buddhist Association purchased the City of Ten Thousand Buddhas site in 1974 and established an international center there by 1976. In 1979, the Third Threefold Ordination Ceremony at the City of Ten Thousand Buddhas was held where monks from China, Vietnam, Sri Lanka and the US transmitted the precepts. It was considered unique as it represented both the Mahayana and Theravada traditions. Originally the site housed the Mendocino State Hospital, founded in 1889. There were over seventy large buildings, over two thousand rooms of various sizes, three gymnasiums, a fire station, a swimming pool, a refuse incinerator, fire hydrants, and various other facilities. A paved road wound its way through the complex, lined with tall street lamps and trees over a hundred years old. The connections for electricity and pipes for water, heating, and air conditioning were all underground. Both the architectural design and the materials used for the buildings were state of the art. The heating and air conditioning were centrally controlled. Considering the natural surroundings to be ideal for cultivation, Hsuan Hua visited the valley three times and negotiated with the seller many times. He wanted to establish a center for propagating the Buddhadharma throughout the world and for introducing the Buddhist teachings, which originated in the East, to the Western world. Hsuan Hua planned to create a major center for world Buddhism, and an international orthodox monastery for the purpose of elevating moral standards and raising people's awareness. The city comprises 488 acres (2 km2) of land, of which 80 acres (0.3 km2) are developed. The rest of the land includes meadows, orchards, and forests. Large institutional buildings and smaller residential houses are scattered over the west side of the campus. The main Buddha hall, monastic facilities, educational institutes, administrative offices, the main kitchen and dining hall, Jyun Kang Vegetarian Restaurant, and supporting structures are all located in this complex. In 2009, the walls of the Long Life Hall were subject to structural damage caused by an electrical fire. However, no major damage occurred to the altar, artwork or statues inside the hall. The Jeweled Hall of 10,000 Buddhas. The Jeweled Hall of 10,000 Buddhas: Finished in 1982, the hall is adorned with streamers, banners, lamps and has in the center a 20-foot (6 m) statue of a thousand-armed Avalokiteśvara (a bodhisattva popularly known as Guanyin in Chinese and Chenrezik in Tibetan). Rows of yellow bowing cushions are lined upon the red carpet. Walls are adorned with 10,000 images of the Buddha, molded by Hua. Hall of No Words: This is where Hua often held classes for his disciples in the early years of the city. The abbot's quarters, where Hua dwelled, were on the second floor. This was also where Hua lay in state during the 49-day mourning period. Now, it is a memorial hall that contains relics of the Buddha, Hsu Yun, and Hua. It is closed to the public and opened on special days. Dharma Realm Buddhist University: DRBU was established in 1976 by Venerable Master Hsuan Hua, who devoted his life to education in developing the human character. The University offers two degree programs: BA in Liberal Arts and MA in Buddhist Classics. In 2018, DRBU became accredited by WASC. Jyun Kang Vegetarian Restaurant: The university cafeteria, which serves only vegan food. The goal is to serve healthful nutritious food full of the good karma of non-harming. Tathāgata (Rulai) Monastery: The dorm rooms for monks (left home persons) and male lay persons persuaded toward the monastic lifestyle. Great Compassion Courtyard: Dorm rooms for guests and visitors. Tower of Blessings: Hua allocated the Tower of Blessings as a home for the elderly monastics residing in the city. Wonderful Words Hall: Site for daily gatherings to listen to Hua's taped lectures in the 10,000 Buddhas Hall. The Five Contemplations Dining Hall, with a forty-foot-high painting of Thousand-armed Avalokiteśvara (the metal bars across the top are heaters). Five Contemplations Dining Hall: Completed in 1982, it is where the monastics and resident lay community follow the formal monastic style in taking their lunch meal. Only pure vegetarian food is served here, and the hall can seat over 3,000 people. Instilling Goodness Elementary and Developing Virtue Secondary Schools: The elementary (kindergarten through 6th grade) and secondary (7th grade through 12th grade) schools were founded by Hua in 1976. The schools are divided into two divisions, Boys and Girls, and teach such classes as meditation, yoga, Buddhism, and World Religions. Many foreign and non-local students also reside on campus in school dorms for the duration of the school year (excepting winter, spring, and summer vacations). As of spring 2006, there were about 130 students in both divisions. Organic Farm: A ten-acre CCOF-certified organic farm, whose produce supplements the meals in the dining hall. Two practices distinguish the City of Ten Thousand Buddhas from many other Chinese Buddhist monasteries: the monastics always wear the long sashes that are worn outside the kāṣāya or monastic clothing, and they eat only one meal a day and only before noon. At night most of them sit up and rest, not lying down to sleep. Monastics at the city do not have any social lives, nor do men and women intermingle. Whereas many ordinary Chinese monks go out to perform rituals for events such as weddings or funerals, none of these monks do so. Some monastics even choose to maintain a vow of silence, for varying periods of time. They wear a tag saying "No Talking" and do not speak with anyone. In cultivation, we have to stick to our principles! We can't forget our principles. Our principles are our goal. Once we recognize our goal, forward we go! We've got to be brave and vigorous. We can't retreat. As long as we are vigorous and not lax in ordinary times, we could become enlightened any minute or any second. So by no means should we let ourselves be confused by thoughts, and miss the opportunity to get enlightened. The City of Ten Thousand Buddhas is a strict Buddhist monastery adhering to the traditional Asian monastic culture although it is located in a liberal area of California. While the traditionalists are more drawn to the spiritual and devotional side of Buddhism, Westerners are often more interested in meditation. Some of the boarding school children are Westerners from the local community who want their children to grow up in a community-oriented place, while some of the children come from Taiwan and Mainland China, even from European countries, such as France, Belgium, and Holland, where parents think highly of Hua. The monastery houses both male and female Sangha, students from the boarding school, and is open to the public. However, males and females have separate campuses, with gender-neutral buildings in the middle of the campus. Many monasteries in Mainland China, Taiwan, and in the West house only monks or only nuns but not both, and are closed to the public. Hua set up the six principles for all monastics and lay practitioners to follow as guidelines for spiritual development. These principles were "to not fight, to not be greedy, to not seek, to not be selfish, to not pursue personal advantage, and to not lie." Different sections of the campus are designated for men or women, and generally the genders do not co-mingle. This is particularly noticeable at ceremonies and meals, where men and women separate into different sections. Out of respect to the lifestyle of the monastics, modest clothing is worn by the laity at all times. Smoking, drug use, and the consumption of meat products and alcoholic beverages are prohibited. Unlike in many temples found in Asia, no incense is ever offered personally by any of the lay practitioners and guests. Hua believed that it was superstitious to insist on personally offering incense to the Buddhas and pointed out that high-quality incense is expensive while poor incense can ruin the walls and statues. Instead, a single stick of incense is offered by a monastic for the entire assembly, and then all practitioners would simply bow and pay respects. A peacock at the City. Many animals roam the grounds of the City, including peafowl, deer, squirrels, and other species. The peacocks are generally quite accustomed to the presence of people and are tame. Peacocks pose a large problem on the farm, so countermeasures have been taken against them, including covering the plants, moving the peacocks to a walnut farm, and planting extra food based on the assumption that a significant fraction will be eaten or damaged by peacocks. During special Dharma Assemblies, a Liberating of Life ceremony is held where many animals - especially pheasants and chukar partridges - bought from hunting preserves are set free. Hsi Lai Temple, associated with the new religious movement Fo Guang Shan and located in Hacienda Heights, California, a city in Southern California, has claimed since 1988 that they are the largest Buddhist temple in the Western Hemisphere. However, the City of Ten Thousand Buddhas has over 80 acres (320,000 m2) of built-up land on 488 acres (1.97 km2) of property as compared to Hsi Lai Temples' 15 acres (61,000 m2), but rather than a temple complex as is Hsi Lai Temple, the City of Ten Thousand Buddhas is more of an entire community with several large buildings clustered together. Therefore, it is unclear which is the largest, as there is a significant difference between the structure and location of the two Buddhist organizations. ^ "Hall of Ten Thousand Buddhas". THE SAGELY CITY OF TEN THOUSAND BUDDHAS. Retrieved 10 September 2014. ^ "About Us". Buddhist Text Translation Society. Retrieved 10 September 2014. This page was last edited on 19 March 2019, at 02:00 (UTC).